Etymology: from the Low Latin mespilus, diverted from a Greek word. For the Greeks, there was not specific term to differentiate the apple, the medlar and the quince. This family is characterised by fleshy fruits, with skin and calyx (shriveled remains of the sepals, style and stamens of the flower), containing pips (which are seeds). Origin : Middle East hence it was introduced into Europe, in the IId century before J.C. The Medlar of Japan resembles it, but it was not classified in the same family. Habitat : it supports the sour fields. It resists severe cold (-20°C). Bark shedding in flakes ruddy reddish-brown. Deciduous foliage. 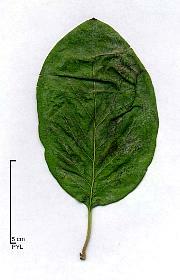 Leaves elliptical alternate (15 cm), curled (embossed), hirsute on the underside, with fine teeth. They resemble that of the quince tree a bit, because they both are curled. The last is rather oval, and less long. Its flower has 5 big white petals (D 3 cm), in May. This variety is autofecund and does not need other trees to be pollinated. Its fruit, the medlar, stands at the top of the twig . It matures from July, but it is edible only overripe, after the first frosts (which soften it). The first true harvest is made at the end of three years. Advices: The medlar makes only to shape him. It flourishes and fructifies copiously without pruning it every year.